U.S. Secretary of State John Kerry is on his way to Havana, Cuba, to raise the American flag over the U.S Embassy there, marking the ceremonial re-opening of the diplomatic facility after the two countries agreed to restore ties that were severed over 50 years ago. Both the U.S. and Cuban embassies re-opened on July 20. The Cuban government hosted a lavish event for its re-opening last month, but the U.S. chose to hold off on its formal ceremony until Secretary of State John Kerry could lead a delegation to Havana. Kerry, who becomes the first U.S. secretary of state to visit Cuba in 70 years, will be accompanied by some members of Congress and three elderly former U.S. Marines who lowered the flag for the last time in Havana in January of 1961. The daylong ceremony in Havana will include a series of events with U.S. lawmakers and other government officials, Cuban government representatives and civil society members, a senior State Department official said. “There are people going to Havana for this event who have not been to Cuba before and that includes some Cuban-Americans, and that has to be incredibly emotional,” the official said during a briefing Wednesday. However, there is no planned meeting between Kerry and Cuban President Raul Castro, the official said. Cuban dissidents pose wearing masks depicting US President Barack Obama and holding pictures of imprisoned dissidents as they protest against the reopening of the US embassy in the island, Aug. 9, 2015. 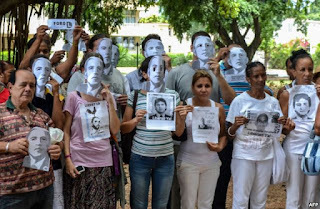 The senior official indicated that Cuban dissidents would not be part of the flag-raising ceremony at the U.S. Embassy. The official added there would be a second, larger ceremony, later in the day at the residence of Ambassador Jeffrey DeLaurentis, the U.S. Chief of Missions. That ceremony will include a range of civil society members, including political, human rights and media activists. A Cuban-American human rights advocate based in Washington said the U.S. move to normalize relations with Cuba may be a set-back for Cuban dissidents. “It is a fairy tale to assume that just because the president [Obama] makes concessions to Raul Castro, then Raul Castro will behave and stop abusing the people of Cuba,” said Frank Calzon, head of the Center for a Free Cuba. Citing the Cuban government’s continued arrests of anti-government protesters and dissidents, he said the Castro government had been “emboldened,” because it had yet to receive U.S. pressure to improve human rights. However, the senior State Department official said the move to re-establish relations would allow the U.S. to continue and “hopefully accelerate” its engagement with Cuba on issues such as human rights and law enforcement. U.S. Rep. Ileana Ros-Lehtinen (R-FL) speaks at a news conference at her office in Miami, Florida Aug. 12, 2015. Some U.S. lawmakers have also questioned the Obama administration’s decision to move forward with engagement, in the wake of human rights concerns. “We [the U.S.] are so hungry for this deal that we are willing to overlook a hundred peaceful dissidents arrested just a few hours before the opening of our embassy,” said Congresswoman Ileana Ros-Lehtinen, a Cuban-American. “It is a cruel insult to the freedom loving people of Cuba and it is a dangerous situation for U.S. national security,” Ros-Lehtinen said at a Wednesday news conference in Miami. Other lawmakers have expressed support, including, Senator Patrick Leahy. “Finally, after 55 years a failed, punitive and ineffective policy of isolation is ending,” he said in a July statement, reacting to plans to re-open the U.S. embassy in Havana. 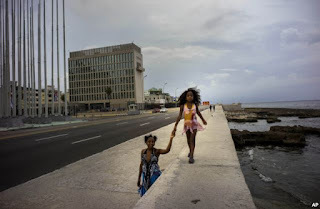 A girls holds her mother's hand, as she walks on the Malecon sea wall, past the the US embassy in Havana, Cuba, Aug. 11, 2015. The embassy reopening will allow more Americans to travel to Cuba and give Cubans increased access to the U.S. embassy in Havana. But Cubans may not see much of an immediate difference in their day-to-day lives. “In the immediate short term, it won’t benefit the ordinary Cuban very much except to give them some hope,” said Philip Brenner, an international relations professor at American University who has traveled to Cuba more than 30 times. Brenner said Congress would need to lift the U.S. trade embargo on Cuba for them to see significant change. Obama has expressed support for lifting the embargo, first imposed on Cuba in the 1960s.